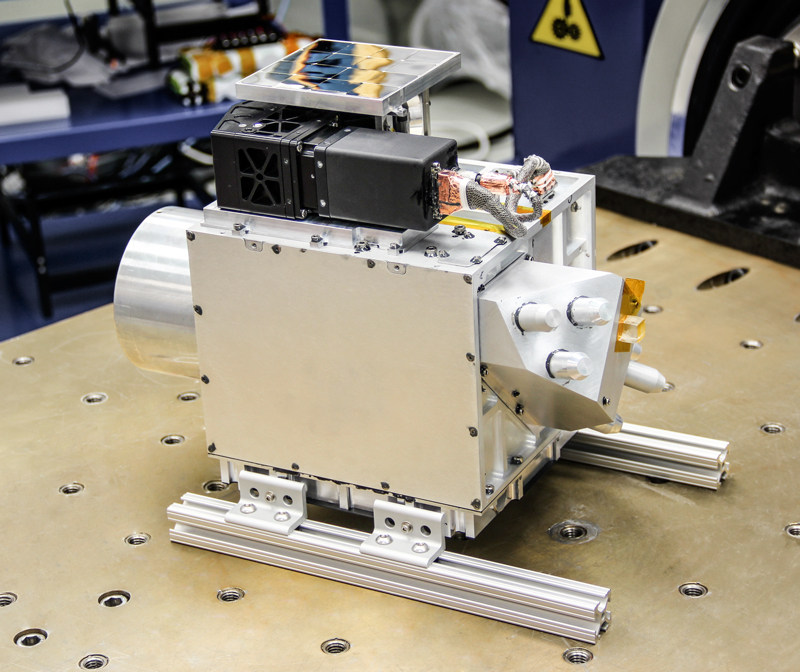 Montreal, August 3, 2015 – The miniature high-resolution imaging spectrometer payload designed for the GHGSat-D micro satellite was delivered to GHGSat Inc. for spacecraft integration at the University of Toronto Institute for Aerospace Studies Space Flight Laboratory (UTIAS SFL) on July 31st, 2015. 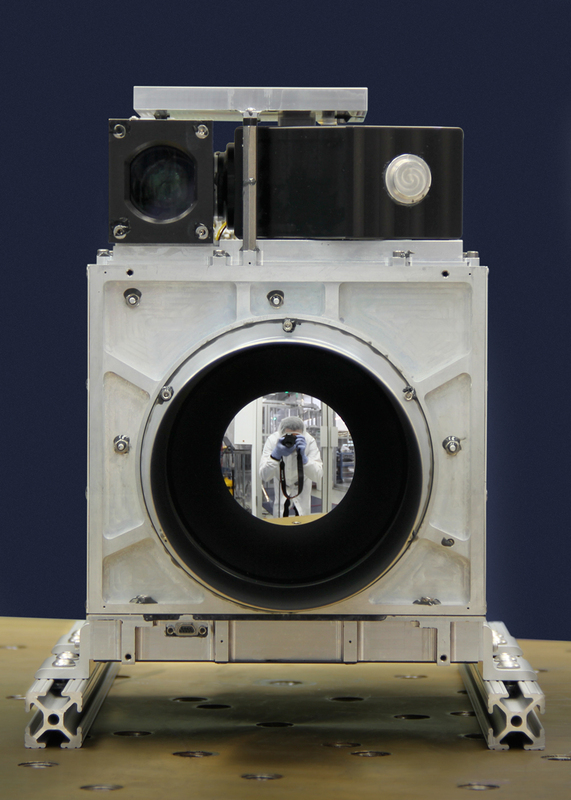 Developed by MPB Communications Inc., the spectrometer is an integral part of the world’s first microSat capable of monitoring greenhouse gas (GHG) and air quality gas (AQG) emissions from individual facilities. The GHGSat microsat dimensions are approximately 450x300x200 mm, and the mass is under 15 kg. MPB’s payload had to be of little mass and volume, function on little power and under a wide temperature range, as well as achieve high optical throughput and high spectral resolution. The final payload is approximately 360x260x180 mm (including baffle), weighs 5.4 kg and is designed to work from -40°C to +80°C with a spectral resolution on order of 0.1 nm. With over a decade of experience designing and building spectrometers, MPB has, with this payload, created a very small and light instrument for its optical specifications. GHGSat’s microSat will circle the Earth every 90 minutes, enabling precise and repeated measurement of emissions from a point source (such as a stack) or area source (such as a tailings pond). Data from the microSat will enable industries to monitor and quantify their own carbon dioxide and methane emissions in order to adjust and better manage and reduce their impact on air quality. GHGSat’s industrial team for the GHGSat-D satellite includes UTIAS-SFL (spacecraft), MPB Communications Inc. (payload) and Xiphos Systems Corporation (avionics and ground segment). Final acceptance review of the spectrometer is scheduled for September, 2015. The GHGSat-D satellite demonstrator is scheduled for launch on a Polar Satellite Launch Vehicle from Sriharikota, India in early 2016. For more information on GHGSat, please visit www.ghgsat.com. Fully integrated GHGSat-D payload on a vibration table. Front view of the GHGSat-D payload.